On April 21st, the Environmental Protection Agency and the U.S. Army Corps of Engineers proposed to “clarify” federal jurisdiction pursuant to the Clean Water Act. Logically, the purpose of a regulatory interpretation is to elucidate the rules of the game. EPA’s/USACE’s rule, alas, does the exact opposite. Instead of clearly defining the limits of federal authority, the proposal would establish a haphazard regime whereby a regulator would determine, on a case-by-case basis, whether a given body of water possessed a “significant nexus” to navigable waters and were therefore subject to federal power. In practice, the test is so amorphous that every ditch, vernal pond, playa lake, mudflat, sandflat, and slough could easily fall under the EPA’s jurisdiction. Indeed, the rule is so expansive that it could claim storm water sewer systems as “waters of the United States”! This presents a cosmic irony, insofar as storm water sewer systems are themselves pollution control mechanisms. This regulatory closed loop–i.e., the regulation of a means of regulatory compliance–was aptly described by National Association of Counties’ Dusty Williams in June testimony before the House Transportation and Infrastructure Committee. Since storm water management activities are not explicitly exempt under the proposed rule, concerns have been raised that man-made conveyances and facilities for storm water management could now be classified as a “water of the U.S.” … This would potentially change the locations of outfalls for [municipal separate sewer systems], and therefore the point of regulation, as defined in the Clean Water Act’s §402. 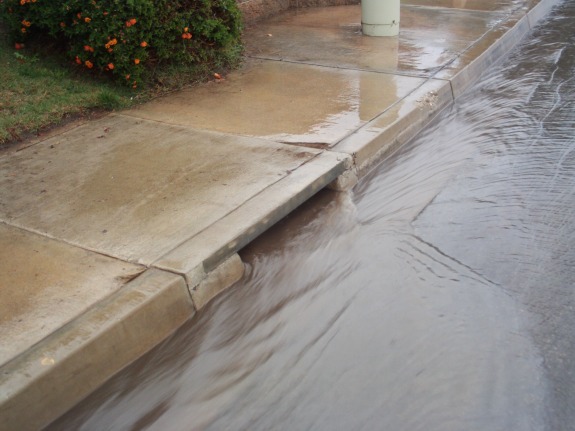 This could mean that [municipal storm sewer system] permit holders would have to regulate, not only at the point of discharge into a “water of the U.S.,” but also when a pollutant initially enters the storm water conveyance system. In layman’s terms, he’s saying that the EPA/USACE jurisdictional rule could inflict a regulatory sledgehammer on municipalities and counties that operate storm water sewer systems. And because storm water management is often not funded by water utility bills, this regulatory burden threatens many localities’ already precarious finances. During [a conference call on] November 6, Donna Downing, of EPA’s Office of Water’s wetlands division, answered, “yes,” when asked if a water of the U.S. can also be a point source discharge. That is, the agency effectively claimed jurisdiction over storm water management systems. Regardless whether the agency intends to subject these systems to enhanced federal oversight, the Clean Water Act (like most environmental enabling statutes) includes a citizen suit provision that affords green special interests the right to sue to compel the agency to act. The upshot is that the agency wouldn’t have a choice. Absent language exempting storm water management systems, state or federal officials would have to make a determination—on a case by case basis—whether there was a “significant nexus” between the sewer system and a navigable water. This determination, of course, would be subject to judicial review. It would be a glorious mess. The rule’s comment period ended on November 14th. I’m unaware of when the agencies intend to promulgate the final rule.